Dazzling interactive light installations, a bold building signature and a festival street create an active, memorable destination. With Portland as our laboratory for analysis and experimentation, we’ve seen cycles of growth and investment that stimulate development and create remarkable, vital urban districts. 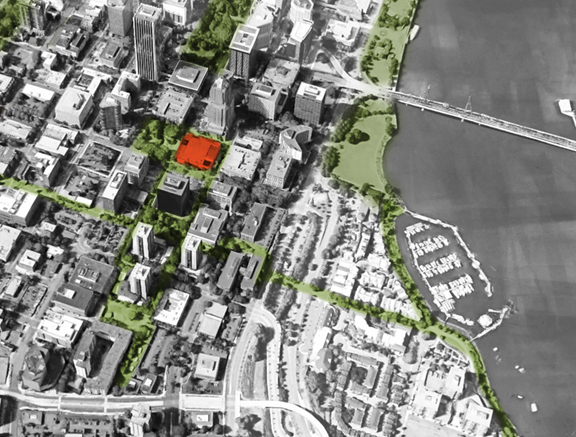 We asked ourselves, while the South Waterfront, Pearl and River Districts have hatched successful new neighborhoods from former industrial brownfields, what about re-investment in one of the highest density, albeit aging, parts of the city? The South Auditorium District rode the first wave of the city’s urban renewal in the 1970s. It was revolutionary in its time, when downtowns nationwide were being robbed of life while real estate developers migrated to greener pastures in the suburbs. 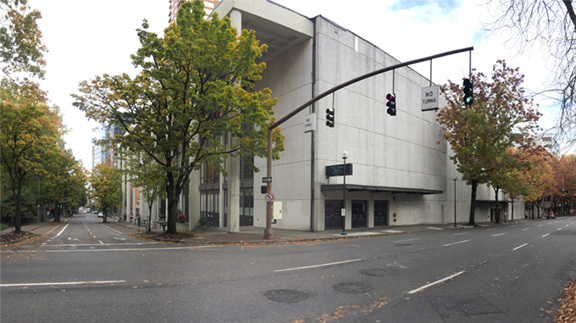 The Keller Auditorium anchors Portland’s South Auditorium District. The Keller Auditorium as it exists today. How can urban and experiential design elevate the surrounding blocks? The infrastructure in this district remains strong. Substantial high-rise buildings, Lawrence Halprin’s sequence of parks, the expansion of adjacent Portland State University, and light rail and streetcar underpin its potential to be one of the most desirable, livable neighborhoods in the city. It’s simply in need of a more exciting, refreshed version of itself. Inspired by this premise, Mayer/Reed and Second Story partnered to envision strategies that would create a bold destination unlike anything else in the city. 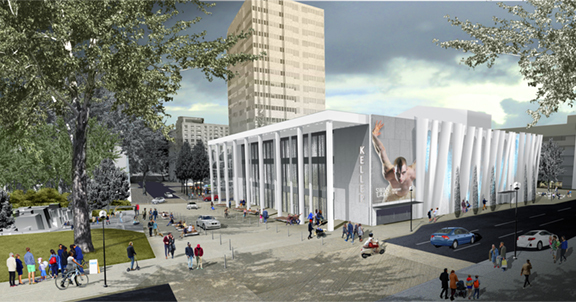 As imagined, urban and experiential design reinvigorate the Keller by day. 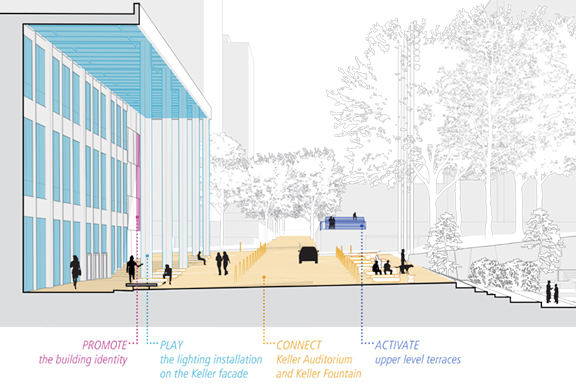 Our design concept builds from the Keller Auditorium and the Ira Keller Fountain as the underlying score for the district’s history and unique personality. Our design principles reflect Portland’s livability: an interconnected fabric of diverse and active neighborhoods, each with a strong identity. From an urban design standpoint, we see a new score for the entire block and surrounding streets, one that alters current patterns. 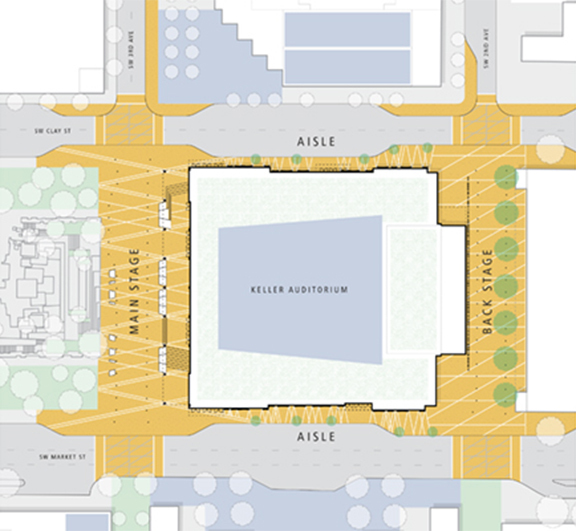 We envision a variety of places for people to experience two Portland gems, the Keller Auditorium and Ira Keller Fountain through a pair of programmable festival streets. One street connects, while the other becomes a catalytic force in re-energizing blank storefronts behind the Keller. 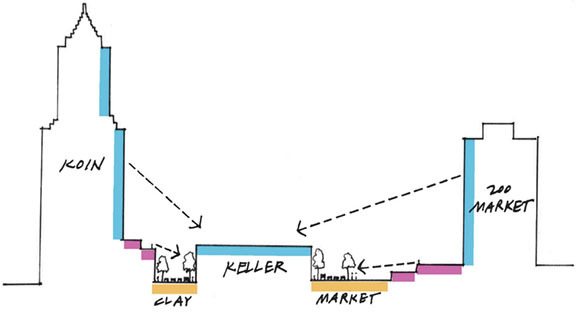 Capturing more public space and elements of urban interest extends to surrounding blocks. Our concept is a theater for living. The Main Stage on SW Third Avenue is a programmable festival street that connects auditorium and fountain to create a cohesive place. This transformed streetscape enables interchange, flow and performance. Periodic street closure on Third enables people to gather for concerts, performances and street fairs. When the building is closed, shimmery curtains cover the interior of the façade reflecting the Keller Fountain. The curtain is constantly reverberating with fluid movement, a nod to the rhythms of performance and urban life. 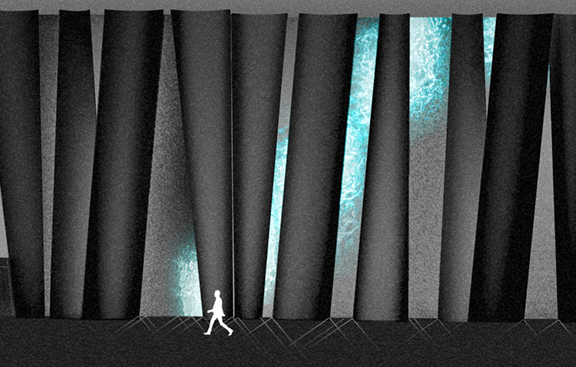 At night, interactive art installations allow people to light up the Keller’s columns. Seating elements engage with the column bases and invite social clusters across the street at the fountain, encouraging people to linger. On a daily basis, the street resumes its typical choreography of vehicular and people interactions. We introduce a bold building identity and information system for the auditorium. A luminescent building signature at each corner references the spirit of Portland’s historic bright lights district. A large-scale transparent media mesh on the Keller’s façade portrays digital motion graphics to promote upcoming shows. The Back Stage on SW Second is envisioned as a more intimate, programmable festival street that becomes a catalytic force to attract new development. This designed streetscape transforms an ordinary service block into an intimate human experience with an impromptu orchestral soundscape. Here, visitors can play a massive sculptural instrument of colorful columns to produce chords and harmonies. 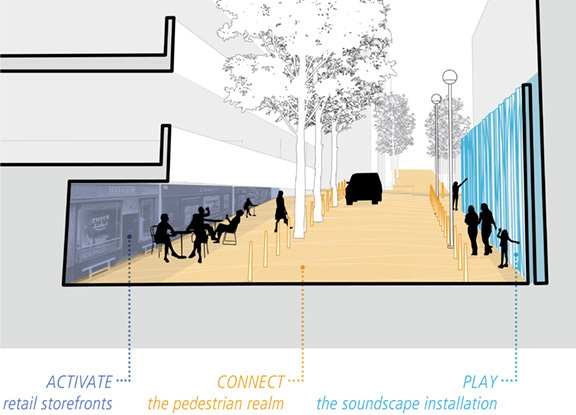 Second Story’s concept for an interactive musical installation activates SW Second Ave.
With re-energized storefronts, ground floor cafes and bars spill outside with lighting and furnishings. The street can be closed for special events such as block parties, neighborhood gatherings, and other activities that benefit from the feel of an “alley” venue. Of course, typical operations, staging and delivery of shows for the Keller are scheduled and accommodated. The Aisles On the sides of the Keller, undulating panels create sculptural interest on previously blank walls. Through sensors, passers-by trigger watery ripples of light on the three dimensional surfaces. Second Story’s motion sensitive light display on undulating sculptural forms activates a previously blank wall. The Balcony Remember the Beatles’ final roof top concert? We weren’t there, but we imagine the “Top of the Keller” has potential as an outstanding venue with spectacular views (after the Keller receives its seismic upgrade). The concept considers the vertical realms we call Orchestra Level (gold), Mezzanine (magenta) and Balcony (blue). Block-by-block, each adjacent building façade has potential to contribute life to the district. Private forecourts, building entries, courtyards, plazas and architectural edges become more habitable and inviting as open spaces. Each block supplements public space so that the entire ensemble is more welcoming, interesting and active on an everyday basis. 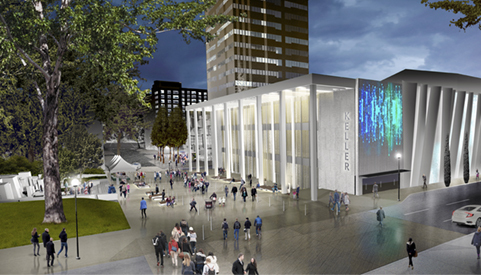 Our concept for an Orchestra Level expands the semi-public realm as an essential part of this urban theater. 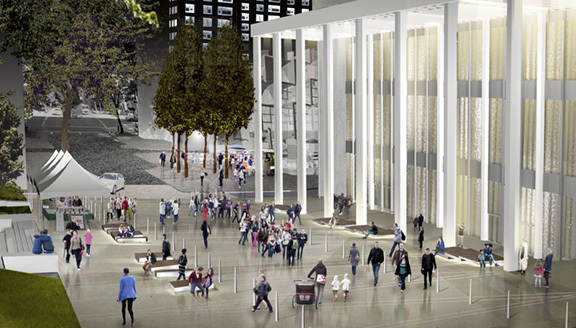 The KOIN Tower plaza and the 200 Market forecourt draws activity to and from the Main Stage. These spaces provide some “messy vitality” with food carts, moveable furnishings and small retail pavilions that add richness, to the district experience. The Mezzanine concept activates existing upper level terraces and roof decks on 200 Market, the KOIN Tower and the PSU Building podiums. Open railings, colorful umbrellas, furnishings, lighting, and landscape draw people to these upper perches. The presence of “people who see and are seen” promote greater social engagement. A vital neighborhood is the sum of its physical parts along with its people. Imagine strangers slowing their pace and saying hello to one another. Imagine people lingering, participating in the daily choreography and taking pride in the identity of the neighborhood. We think the South Auditorium District’s time has come to transform into one of the most remarkable urban neighborhoods in our city!